OAKHURST — Heads bent in concentration, youthful brows furrowed slightly, fingers resting gently on fabric as the tac-tac-tac sound of multiple sewing machines fills the large room. And no one’s on their phone. This has been the scene recently as the Mountain Sewing Club — a group of girls age 8 to 11 — has gathered with lead instructor Tina Horn, who developed the structure and projects of the class. She makes sure the lesson is not overwhelming for even the most nervous beginner. 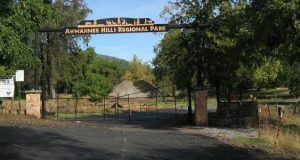 The group meets at Yosemite New Life Church, and about ten girls showed up on the very first night. 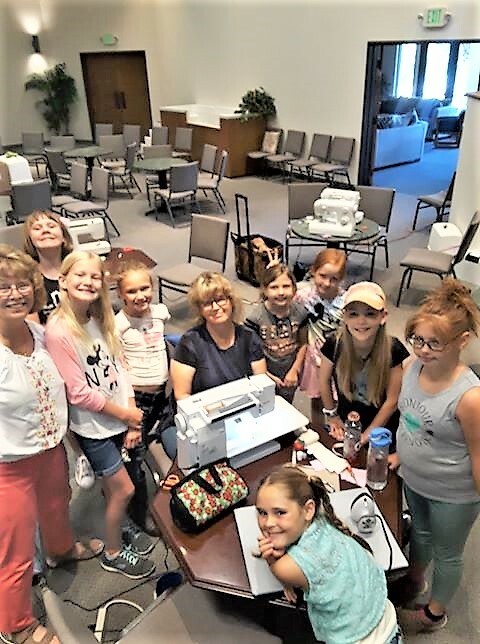 Some of their mothers or grandmothers stayed with them for their first lesson and several volunteers joined Tina, including her own mother, Carolyn Honnette. 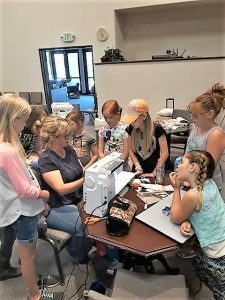 A ‘tween and teen class meets on a different day. The girls seem to love the workshop and, for instructor Tina, it’s a bit of a dream come true. It’s a form of art that’s been neglected in our school systems for the last 30 years, adds Tina. To prepare for the classes, Tina buys material in bulk and cuts in advance. A $40 materials fee for the class series can be split up over the course of several weeks, and each class itself is $17. With projects like pin cushion, supply pouch, pillow case and pot holder, t-shirt pillow, pajama shorts and hem pants, purse, fabric basket and clothes hamper, the idea is to make things people can use. 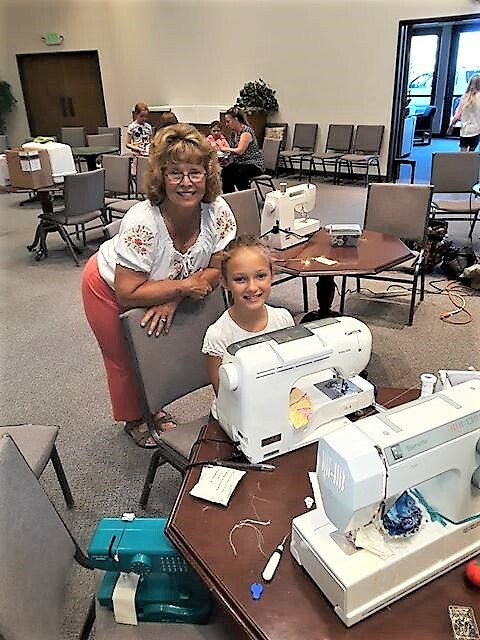 Generations come together to sew. 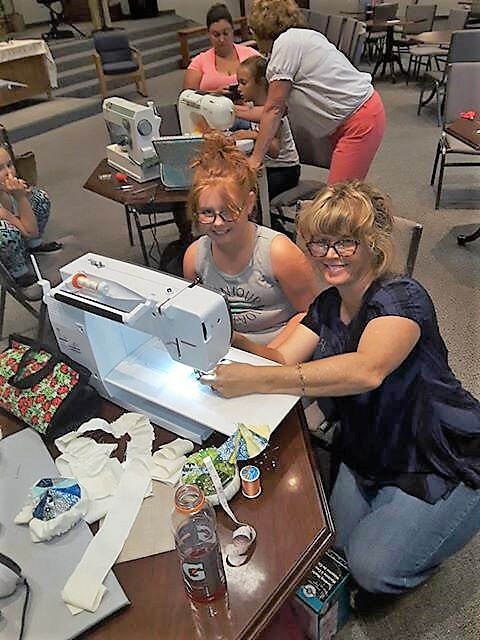 Students bring their own sewing machine if it works well, thread, pins, fabric scissors, and some other supplies or personal items, like pants they may want to hem, or a t-shirt for the t-shirt pillow. 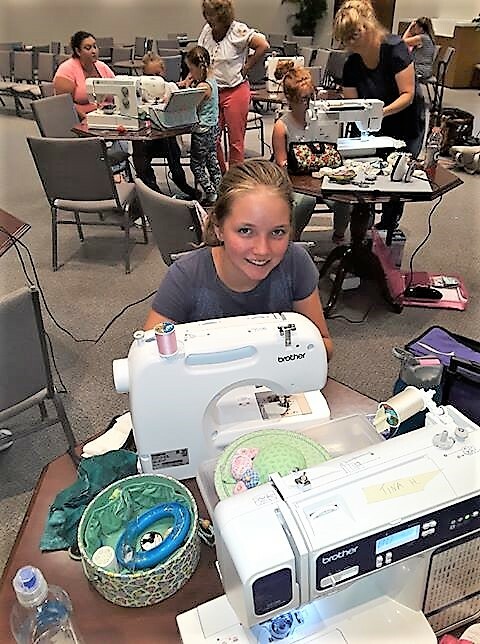 Tina has purchased and now supplies many of the sewing machines used for class. 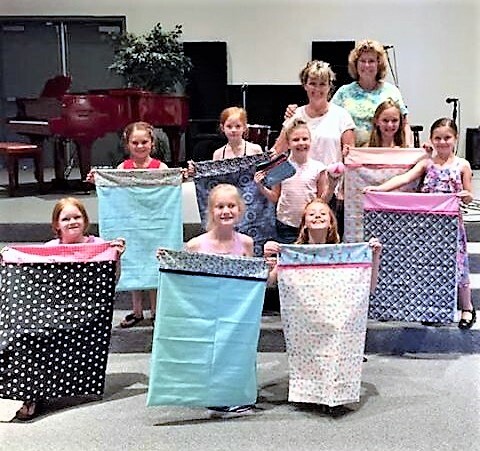 Local mom Lori Prentice volunteered to organize the summertime event after two mother-daughter apron making classes were successful and well-attended last winter. 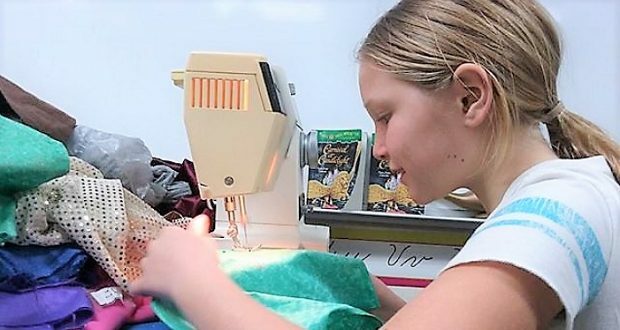 Ginger started sewing at six, and made everything from her own backpack to formal dresses, and a replica Civil War dress for authentic re-enactments. 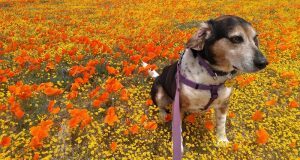 Eventually, she joined the group Angel Gowns in Fresno. 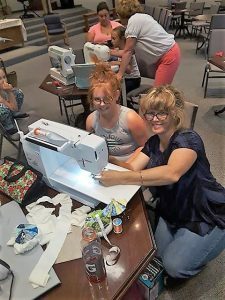 It was at those meetings that Lori says she realized sewing was more than a skill — it can be a poweful vehicle for love. Tina loves sharing her passion for the art. 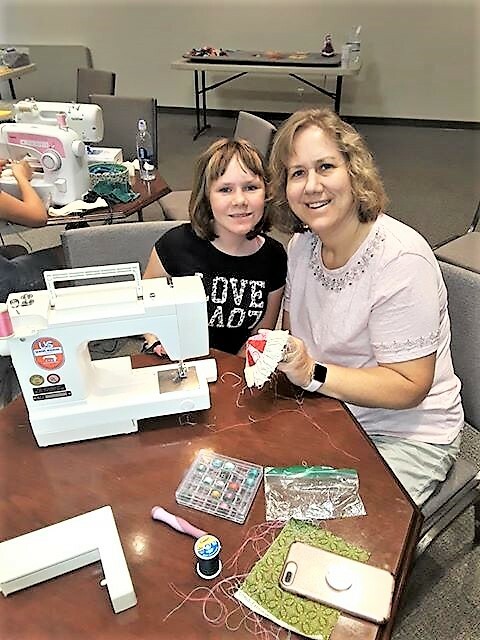 When she found there weren’t many girls Ginger’s age who were into sewing, Lori said, “sometimes you have to make your own tribe.” That’s how the recent sewing phenomenon began. Lori says the rewards are many, and points out that sewing takes a lot of patience and perseverance. The community has enthusiastically embraced the idea: the church donates the space at no cost, and the class for older students came equipped with a waiting list. “I’m hoping this will be a tribe of young people who problem-solve and persevere and create together,” add the upbeat organizer. Tina says the best moments are the ones when students see their work in its completed stage for the first time. She innumerates the many benefits to the workshop.While they learn to sew they’re making friends with common interests. In the beginning, most were quiet and shy and now they all talk and laugh while they learn. 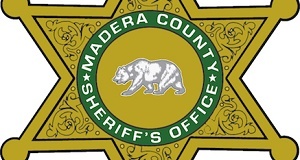 The class runs two more weeks, and there’s talk of an ongoing beginner class for new students, and a continuation of projects with varying degrees of difficulty for those who have their basic skills. 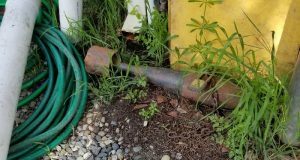 Anyone interested can contact Tina Horn through Facebook Messenger or via email at ourhousemtntop@gmail.com, or call/text at (760) 677-5635. 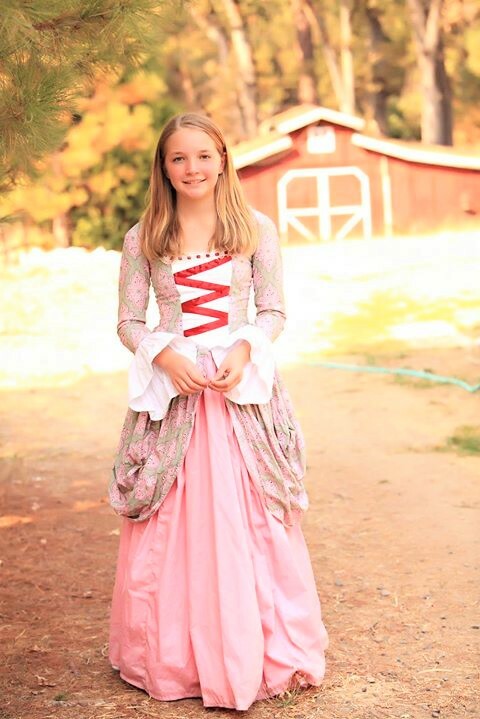 Ginger’s hand-made Civil War re-enactment dress.